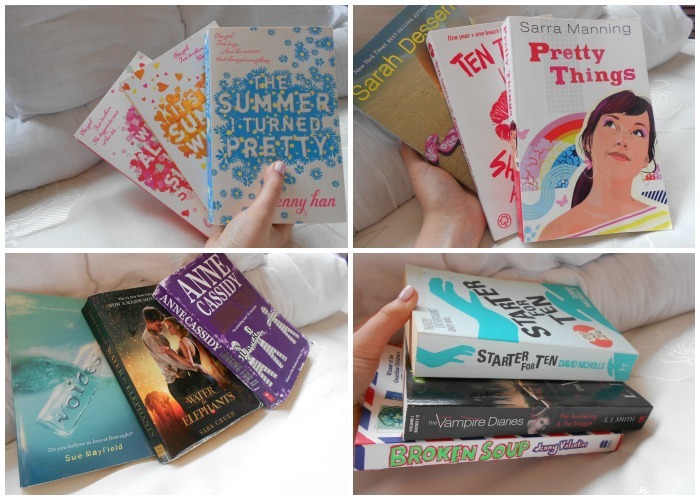 Second photo - Someone Like You by Sarah Dessen, Ten Things We Shouldn't Have Done by Sarah Mlynowski and Pretty Things by Sarra Manning. Third photo - Voices by Sue Mayfield, Water For Elephants by Sara Gruen and Looking For JJ by Anne Cassidy. Fourth photo - Starter For Ten by David Nicholls, The Vampire Diaries (books 1&2) by L.J Smith and Broken Soup by Jenny Valentine. If you've been reading my other Summer Reads posts (here, here and here) then you'll be sensing a common trend with the Summer trilogy by Jenny Han. I honestly didn't mean for them to play such a big part in this series but they are definitely my favourite summer books so it's just amazing luck that I found them yesterday! When I saw them I knew I couldn't leave them in the shop so I bought the three of them for a giveaway. I'm not giving away these copies as they aren't in very good condition, so instead I'm giving away my own copies and keeping the ones from yesterday for myself. I take amazing care of my books so I promise the giveaway prizes are like new. Click HERE to find out more about the giveaway. Water for Elephants is incredible. It's one of my favourite books. I'd love to read 'Water for Elephants' and I heard the movie is just incredible. On my to-do-list at the moment right now.